Are obligingly backed by the latter. This week, the global business and political elite meet at the World Economic Forum in Davos, Switzerland. Founded in 1971, the WEF describes itself as an international organization of large corporations "committed to improving the state of the world" with "no political, partisan or national interests." But, says Bloomberg columnist Jonathan Weil, "It’s becoming hard not to suspect that the annual gathering in Davos has become a conclave for global elites to promote crony capitalism and state-backed enterprise, ensuring that national coffers remain available to be tapped for private gain." 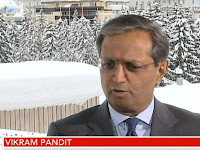 Exhibit A in Weil's case against the Forum is its Co-Chair, Citigroup CEO Vikram Pandit. Angrily detailing the ways in which Pandit has "failed upwards" at his former hedge fund and then at Citi, ultimately taking multiple federal bailouts while declaring his institution to be sound, Weil concludes, sarcastically: "These little rough patches in the financial industry offered just the kind of hands-on experience the forum’s organizers were looking for in a leader, in which case they found their man."